Judge orders release of Guantanamo prisoner force-feeding videos. 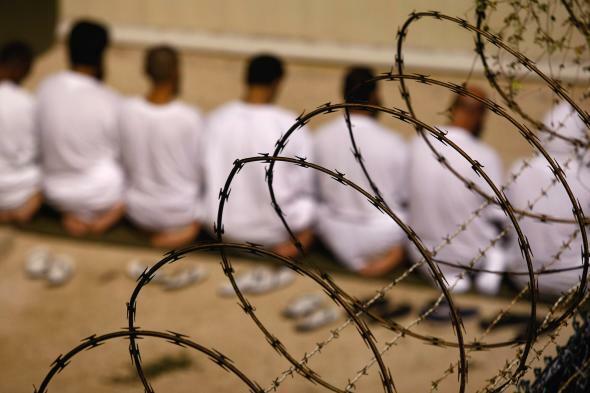 A group of detainees during morning prayers at Guantanamo. A federal judge on Friday ordered the U.S. government to prepare to disclose videotapes of the force-feeding of a Guantanamo Bay prisoner. The prisoner, Abu Wa’el Dhiab, who has been held at Gitmo since 2002, has been on an extended hunger strike. The government intervened, forcibly removing him from his cell and force-feeding him though the nose, beginning in April of last year. The ruling, which allows the tapes to be redacted so that they only show Dhiab, comes days before opening arguments are scheduled to be begin on “Dhiab’s effort to stop the forced feedings and cell removals,” the Guardian reports. The government is expected to appeal the ruling.